Asthma concerns me. I’ve had many close friends and family suffer with the disease. In fact, a very good friend died of an attack while in medical school, because he didn’t have his inhaler with him. In other words, this is somewhat personal. I’ve probably given more lectures on asthma than any other topic over the years, and I can say without hesitation that relative to how much we know about its prevention and treatment, I can’t think of another disease where we underperform as much as with asthma management. According to data from the National Institutes of Health, over the last few decades the death rate has increased by over 55%. The prevalence rate has increased by 75%, and among African-Americans the hospitalization rate has increased over 35%. The good news is asthma can be controlled and effectively treated. In this primer, we’ll discuss quick tips to improve the health of the asthmatic in your life. The encouraging thing about asthma is that if you understand what causes it, you understand how to treat it. Here’s what you need to know about what causes asthma. For the purposes of discussion I am simplifying matters for general consumption. Asthma is a result of certain triggers, causing inflammation to your airways over a long period of time with the occurrence of attacks (intermittent exacerbations). These triggers can be thought of as allergens. Examples of these triggers include cigarette smoke, dust, aerosols, cold air, long-haired animals (especially cats), seasonal pollens, and exercise (in some). These triggers create a state of inflammation and hyperresponsiveness in the lungs, leading to the excessive production of mucus within the lungs’ various airway branches. If bad enough this will lead to complete obstruction of the airways. In other words you’ll stop breathing, and you will die without assistance and/or reversal. 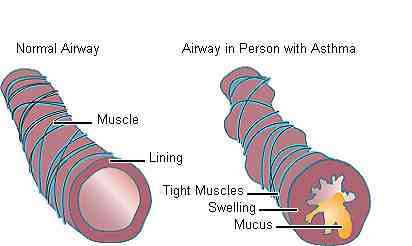 Exacerbation of asthma include breathlessness, chest tightness, coughing, and wheezing. Basically, because you have the functional equivalent of snot in your lungs, your airways are narrowed, and you’re having difficulty breathing. After all, it’s harder to breathe snot than air. Now imagine how your lungs feel when you’re adding cigarette smoke to that mix. Let’s get logical. Asthma management is theoretically straightforward if you can pull it off. Prevention is treatment. I used to describe this as “Kill the Cat.” (This blog neither supports, advocates, nor is responsible for the harming of any animals resulting from this information.) In short, if you identify the triggers that precipitate your asthma attacks and then remove yourself from that environment, you will dramatically reduce, if not eliminate, your attacks. This is often described (incorrectly) in kids as “growing out of their asthma.” No one grows out of it, and you don’t cure asthma; asthmatics just stop having attacks because they’re not around the triggers. In Part II, we discuss asthma management. In case you’re wondering, that’s where the toothpicks come in.